Andrew Kreps Gallery, in collaboration with kaufmann repetto, is pleased to announce the first survey exhibition in the United States of Bruno Munari's. Bruno Munari described himself as an “artist, writer, inventor, designer, architect, and illustrator,” a list that is nowhere near exhaustive. He began his career at an early age during the second wave of Italian Futurists, exhibiting his work for the first time in 1927 at Galleria Pesaro, Milan. Simultaneously he pursued activities as an art-director, curator, and illustrator. In the years following, he progressively moved away from the influence of Futurism, developing an extremely personal and singular project over the course of 60 years. 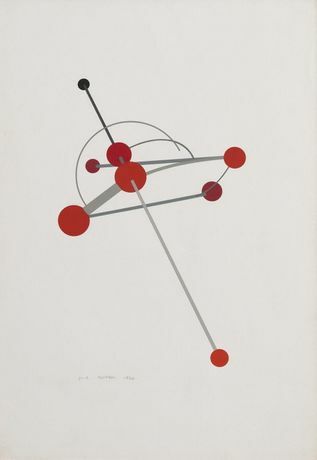 In 1930, he produced the “Aerial Machine”, from which came his “Macchine Inutili / Useless Machines”, anticipating his interest in the deconstruction of the traditional work of art. Much of Munari’s work is characterized by a pedagogic interest and a radical vision of expanding man’s understanding of the world through the development of new forms of visual communication. Prolific in output throughout his life, and tirelessly inventive, his work includes some of the earliest experiments in what Munari himself would term "programmed art", as well as light art, installation art, projection-based art, and photocopy art. Throughout his work, Munari viewed technology as a democratizing force within Art, citing the potential for an “art by all”, and the destabilization of the idea of the singular artistic genius. The exhibition, which will occupy both the gallery's 537 and 535 West 22nd Street locations, will include seminal works from key moments within Munari's oeuvre. Beginning with his turn to abstraction, and "Macchine Inutili" in the 1930s, the exhibition will highlight themes that remained constant throughout his career. These include his interest in dynamism or the study of the fluidity of signs and shapes that first brought Munari to programmed art; his engagement with the machine, displayed through his use of the photocopier, experiments with light, and the creation of fossils for the future; and poetics and wit through his use of found objects, research into language and the human face, and theoretical reconstructions of imaginary objects. The majority of the works to be exhibited have not previously been shown in the United States.